Wow talk about oodles of goodies ! There is so much to pick from you may have to take one of each ! Nothing screams farm fresh more than strawberry jam or a fresh strawberry cake !! Farm-Fresh Jams and jellies (12 oz. jars) are available for purchase in our farm store and by email or phone (931) 389-6470. Jam gift boxes are available as well. Sisters, Linda Potts Williams and Vickie Potts Pyrdum make each batch of prize-winning jam by hand from the fresh fruits of the season. Valley Home Strawberry Jam, made from our own strawberries picked at the peak of ripeness, proved to be a winner by earning top three honors at the 2004 North American Farmers Direct Marketing Crystal Jar Jam Contest in California. Give it a try for the best jam you have ever tasted. No preservatives or additives, just great food…made fresh on the farm. 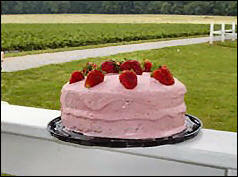 Fresh Strawberry Cakes are baked fresh on the farm every day during spring strawberry season. Made from our Valley Home secret recipe, our large 9” double-layer cakes are made from our strawberries, topped with our special strawberry cream cheese icing and garnished with beautiful, plump strawberries. Indulge yourself, surprise your family or treat a special friend. Available from our farm store in season. Due to their popularity, we recommend you call ahead to order. 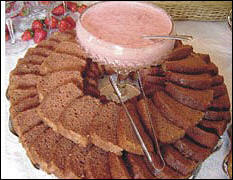 Fresh-baked Strawberry Bread (12 oz. loaf) is an any-time-of-the-day treat. It’s a moist bread that is great right out of the package. A great addition to a hearty breakfast, enjoy this bread warmed…don’t forget the butter! Made fresh daily during spring strawberry season and available at our farm store. Golden Pound Cake is the first layer of a memorable strawberry shortcake…topped, of course, with our Valley Home Farm strawberries and plenty of whipped cream. Does it get any better than that?! 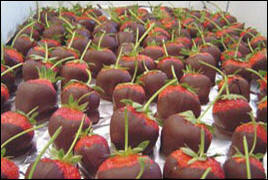 Chocolate Dipped Strawberries are one of our special springtime treats. We hand-select the finest long-stem berries and dip them in rich chocolate. Great for special occasions like Mother’s day, weddings, parties or a gift for that very special person. Available only by advance order by calling our farm shop (931) 389-6470. Sold by the dozen, a two-day notice is appreciated. Strawberry Honey Pops are frozen, healthy and natural treats with a “wow” factor! Made from our fresh Valley Home Strawberries and sweetened with honey, a large 4 oz. “fruit on a stick” is something to look forward to after the strawberry picking is done.